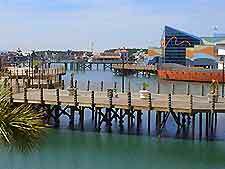 The popular vacation resort of Myrtle Beach offers visitors a relaxed pace of life in which to enjoy the oceanside activities and attractions that can be found within this charming city. 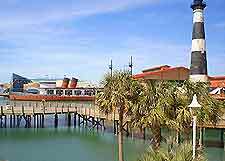 Tourists visiting the resort will find navigation around the coast easy, while visitors are also recommended to travel farther afield and explore the suburbs of Myrtle Beach and its surrounding areas. Advice and assistance in planning your trip can be sought at any of the city's visitor centers along with all manner of brochures, information and travel tips. There are four main visitor centers at Myrtle Beach, making information about the area and its attractions easily accessible for visitors. Advice, brochures, bus timetables, travel tips, events calendars and maps are all available at these centers. Visitors will have no trouble settling into Myrtle Beach lifestyle, which is very conducive to the tourist industry that thrives here. 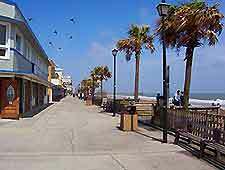 With relaxing settings to shop and dine in, travel to and within Myrtle Beach is an altogether pleasurable experience. There are literally hundreds of languages spoken all over America due to the large Hispanic, Chinese and Japanese communities and other ethnic minorities. 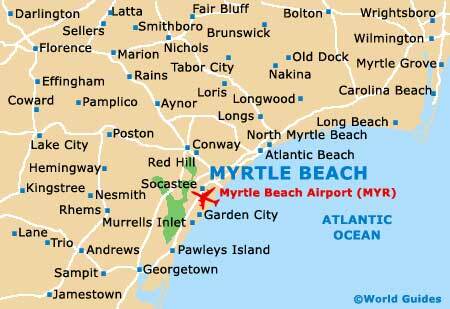 The most common language in Myrtle Beach, South Carolina and throughout America is English. Prior to your arrival in Myrtle Beach, always check with your nearest consulate or embassy for details about whether you need a visa for travel to Myrtle Beach and the USA. Visa applications should always be made well in advance. A number of categories of non-immigrant visas are available for those wishing to work in Myrtle Beach and the USA temporarily. Working without a visa is against the law in America and harsh penalties are enforced. Those intending to work in Myrtle Beach should apply for the relevant working visa in their home country and may need a letter or documentation from their prospective Myrtle Beach employer. Currency in circulation today in Myrtle Beach, South Carolina, is typical of the United States of America. The American dollar is the official currency of the USA, and is commonly known as buck. Dollar bank notes in Myrtle Beach are usually called bills and come in denominations of $1, $2 (unusual), $5, $10, $20, $50 and $100. The dollar is divided into 100 cents and coins in Myrtle Beach come in denominations of 1 cent (penny), 5 cents (nickel), 10 cents (dime) and 25 cents (quarter) and a 1 dollar coin. Tipping is generally expected throughout Myrtle Beach and in many cases required, unless service has been extremely poor. Restaurants in Myrtle Beach usually expect a tip of between 10 to 20 percent, together with the city's taxi drivers. Bars in the city also appreciate some kind of gratuity and often have special tips trays on the counter. Hotel staff in Myrtle Beach also expect a small tip, which may be as little as a dollar. When dining in Myrtle Beach, you will find many restaurants now operate a strict 'no smoking' policy. Smoking is now also not allowed on public transportion options in Myrtle Beach, which include bus and train travel. Before smoking in public areas in Myrtle Beach and South Carolina, check with those nearby.